The folks over at Kinsta.com have put together some end of the year usage statistics for PHP across the web trying to answer the "is PHP dead?" question. People have been calling for the death of PHP for years now (you can find “Is PHP Dead?” posts as far back as 2011). And yet, PHP still persists… In this post, we’ll dig into the data and show how PHP isn’t close to being dead (even if you really wish it were). The article talks about how, despite PHP not being the "most modern programming language", it's still in use by almost 80% of the websites on the internet (8 out of 10 sites). While the number is declining slightly, it's still large chunk of the web based on the reporting from the X-Powered-By header. They also point out that PHP is faster and better than ever with new, impressive features being added constantly and new versions being regularly released. They also note that it's easy to find PHP developers (with actual experience) and, while you don't have to like PHP, it's definitely far from being dead. You can listen to this latest episode either using the in-page audio player or by downloading the mp3 directly. If you enjoy the show, be sure to subscribe to their feed and follow them on Twitter to get updates when new shows are released. In a new post to his site Gonzalo Ayuso talks about the Silex project (a Symfony-based microframework) and how it just might be dead. The last week was deSymfony conference in Castellón (Spain). IMHO deSymfony is the best conference I’ve ever attended. [...] This year I cannot join to the conference. It was a pity. A lot of good friends there. So I only can follow the buzz in Twitter, read the published slides (thanks Raul) and wait for the talk videos in youtube. In my Twitter timeline especially two tweets get my attention. One tweet was from Julieta Cuadrado and another one from Asier Marqués. [...] Tweets are in Spanish but the translation is clear: Javier Eguiluz (Symfony Core Team member and co-organizer of the conference) said in his talk: “Silex is dead”. He goes on to talk about how, despite the overly dramatic title, the Silex project isn't really "dead" but does have an uncertain future. He talks some about the next version of Symfony - Symfony 4 - and how, because if the changes since v3, it could essentially replace most of what Silex offers. Unfortunately, this also leads to another problem - Symfony 4 isn't ready and if Silex will be deprecated which should he choose for new projects? After some investigation, he decided that Lumen, a Laravel-based microframework, was just right for his needs. Lumen is dead. Long live Lumen. In a new post to his site Jason McCreary offers some of his opinions around why he thinks Lumen is dying. Lumen is a micro-framework from the creators of Laravel offered as an alternative to the full-on Laravel framework. Jason (creator of Laravel Shift) shares some of his own statistics around Laravel versus Lumen "shifts" and some graphs that help to support the theory. He suggests that part of the issue is that there's less focus on a wider, more general use of the tool and how he suspects that the Lumen feature set will continue to lessen. He ends on a more positive note, though, suggesting that Lumen as it stands may not exist in the future but may live on integrated into the Laravel framework. Christian Scheb has posted about an interesting idea in this article on his site - creating "tombstones" in your application to help you determine what code in your application is "dead". Earlier this year I took over that project at my new company. [...] The repository was cluttered by many files, that could assumed to be dead code. Unfortunately, you never know. [...] The mission was clear: Cleaning up the project, without breaking things. [...] I searched the web and came across that interesting concept of tombstones. If you haven’t heard of tombstones yet, I highly recommend this article and watching the video of David Schnepper’s ignite talk. A tombstone is basically an executable marker in your code (in the PHP world: a function call), which is placed in fragments of code, that you’ve assumed to be dead. Then, everything is deployed to production and, when a tombstone is invoked, it writes some data to a log. 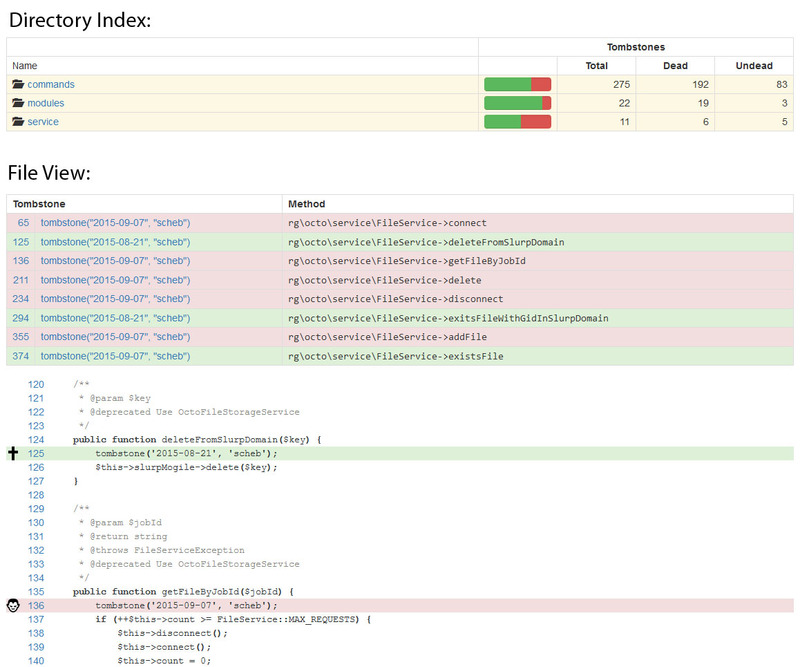 After a while, the logs will enable you to identify dead and undead code (called “Vampires”) in your project. Not finding a good tool to help with this in an existing codebase, he created a library that makes it simpler to both mark the "tombstones" in your code and another to analyze the results. He includes an example of what the report might look like, showing both the used and unused bits of code where the tombstone code was placed. Allan MacGregor has a post to his site with some of his thoughts on why TDD isn't dead and is still a viable option to help reduce bugs and improve software quality. So, where does this whole TDD is DEAD thing came from? Well, it all started with let's say a provocative talk and follow up blog post by David Heinemeier Hansson (@DHH) where he expressed his frustration with testing and put into question the value of TDD. [...] TDD is not dead, not really. And it won't really ever be dead, it will change or be replaced with something better; in fact it already has, and in my Magento Extension Test Driven Development book we focus on Behavior Driven Development, an approach that emerged from the original TDD methodology. TDD created test-induced design damage. He ends with the most common misconception about testing in general too: i"t's too much work/it will make my development slower." He also looks at some of these kinds of comments specifically targeted at Magento 2. In his latest post Derick Rethans talks about something that plagues every project, PHP or otherwise, after its grown to a large enough size: dead code. He's been asked why his Xdebug tool finds this code in places where people don't expect, so he figured he'd answer it once and for all. The explanation for this is rather simple. Xdebug checks code coverage by adding hooks into certain opcodes. Opcodes are the building blocks of oparrays. PHP converts each element in your script - main body, method, function - to oparrays when it parses them. The PHP engine then executes those oparrays by running some code for each opcode. Opcodes are generated, but they are not optimised. Which means that it does not remove opcodes that can not be executed. He gets down to the opcode level and shows some output from vld on how things are being executed (and what's not). Using a simple "foo" function example, he shows the execution flow and how the "branches" of executions work through the code. In his case, the "dead code" marker is coming from the line with a closing brace from an "if" statement. He points out that it entirely depends on the lines executed as to what is marked as "dead code". On DesignAeon.com there's a recent tutorial posted showing you how to extract URLs from your database and determine which ones are "dead" automatically with the help of cURL. Checking Deadlinks From the database manually is a Headache ,So why not use a script which return the http status of the particular link and tell us if the link is dead or not.So how do we check the dead links from the database ? How do we programatically check whether the link is dead or not ? To check broken or dead links from Database we will use curl . Included in the post is a sample script that extracts the URLs from a field in the database (you'd need some extra smarts if you're pulling it from content) and running it though a "checklink" function. If the call to curl_getinfo returns false, the link is marked dead. Derick Rethans has been working on some updates to a tool he's developed, VLD, to make it more helpful and effecting in optimizing the opcodes in your scripts and find the dead opcodes and paths. He talks about these updates in this recent post. Recently I've been working on some new functionality to visualise all the code paths that make up each function. These new routines sit on top of the routines that do dead code analysis. These new routines sit on top of the routines that do dead code analysis. Every branch instruction (such as if, but also for and foreach) is analysed and a list of branches is created. [...] Once all the branches and their links are found, another algorithm runs to figure out which paths can be created out of all the branches. He illustrates with a few examples, showing both the command that was executed and the resulting output with the new path information of a simple test file using a "for" loop and an "if/else" conditional. International PHP-Magazine - Is it dead? Hasin Hayder asks a question in his latest blog post that some in the PHP community have been wondering for a while now - is the International PHP Magazine dead? He points out six things that the magazine and its staff are doing including RoR articles in an issue, content on the site that's way out of date and the smaller size of recent issues. Comments to the post point out that there has been issues released but that the magazine is published by a non-technical company that just might be pushing this particular publication aside.